If you love flying, don’t miss the annual SLV Pilot’s Association Fly In and Air Show. 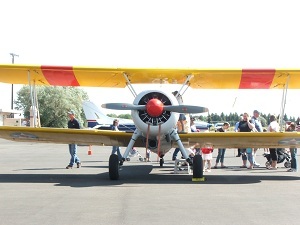 This year’s show was held on Saturday, July 16, 2011, at the SLV Regional Airport in Alamosa. This event is free to the public with donations greatly appreciated. To start the day off right a tasty breakfast is held from 7 a.m. – 10:00 a.m. for only $5.00. 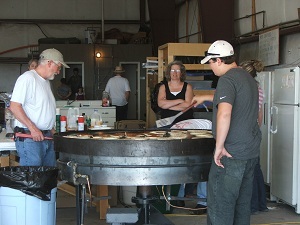 It is delicious and I always enjoy watching them cook many pancakes at one time on the large rotating griddle. It is a great idea to bring sunscreen, a hat, umbrella (if desired), and folding chairs. Most people line the edge of the paved section with their folding chairs and enjoy watching the aerobatics in real comfort. 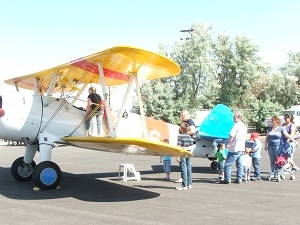 There were 15 – 20 airplanes available for viewing this year and approximately 1,500 people attended the event. To help promote other Alamosa Events there were several antique cars to entice people to come to the Early Iron Festival which is held in Alamosa on Labor Day weekend. At 10:00 a.m. the aerobatics begin. Mr. Doug Nelson, an Aurora based pilot, thrilled the many on-lookers with his daring stunts. I enjoy flying, but I don’t believe I could handle being upside down or in a tail spin heading towards the ground! Gregg Baker also entertained the crowd with his many stunts. At 11:00 a.m. there is a lunch which is served for those who don’t want to make it to the breakfast. Drinks are also available throughout the day and several vendors are selling their products. There are airplanes for you to walk around and look inside. It is fun to see all the different makes and models. I especially enjoyed watching young children’s faces as they are in awe of the airplanes! There are men and women in military uniform there also. It is great to see our military personnel there. The lineup of airplanes changes every year. One year a Stealth Bomber was there. That has to be one of my most memorable times as it was so quiet when it flew over. It was so amazing to watch it make several passes over the crowd. What an amazing airplane that is! Another memorable year was when there were several fighter jets available for people to climb up and look at. There were also military personnel available to answer any questions about their jets. It was a wonderful, amazing sight when they took off right in front of the crowd. The fighter jets then did several fly bys of the area. It sent chills down my spine at the sight and sound of those fighter jets in formation! The SLV Pilot’s Association and Air Show will host two more shows this summer. On Sunday, August 7, 2011, there will be one at the Rominger Airport in Del Norte in conjunction with the Covered Wagon Days celebration. A breakfast will be served beginning at 8 a.m.
On Sunday, September 18, 2011, another one will be held in Creede in conjunction with the Crusin’ the Canyon Car Show. Plan to attend either or both of these fly ins. 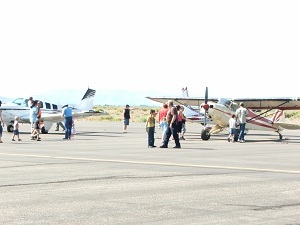 The SLV Pilot’s Association Fly In and Air Show first started in 1978 and was held at the Monte Vista Municipal Airport. It moved to the SLV Regional Airport in Alamosa in 1998 to accommodate more airplanes. Make sure to look for Mr. Paul Foster who is the president of the SLV Pilots Association. 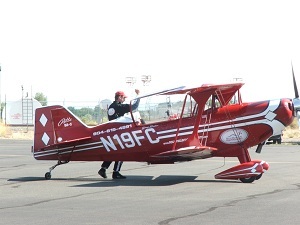 Mr. Foster has a real passion for flying and is a wonderful organizer of the fly ins throughout the Valley. Mr. Foster has been president for 30 years. He told me he has actually been president for 31 years, but one year the runway at the Monte Vista Municipal Airport was being rebuilt, so the association didn’t have a show that year. Don’t miss the 2012 SLV Pilot’s Association Fly In and Air Show which will be held on Saturday, July 14, 2012. You won’t be disappointed if you love airplanes and aerobatics!